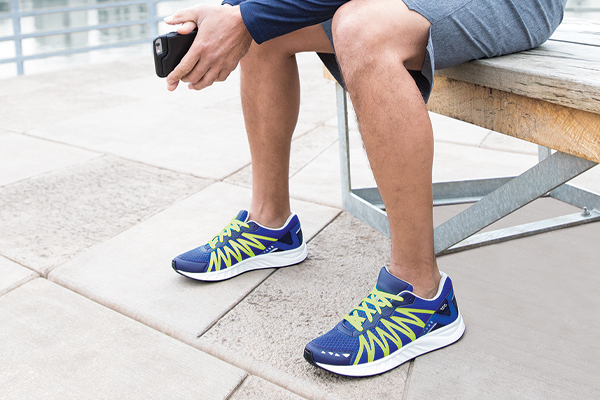 Keep up with your workout in this innovative women’s active shoe. The EZ Lace system provides even tension across the instep as laces slide easily. A removable footbed, shock-absorbing midsole, and a flexible outsole keep your foot supported and cushioned when you need it most. An Active Comfort shoe for women, Tour Mesh is engineered to have the same comfort features as our SAS Foot-Shape® walking shoes. Initial fit should be wide enough to stay very comfortable across the ball of the foot yet roomy enough in the front so the toes are not cramped. The heel should be snug and should not slip while walking. SAS Foot-Shape® Last: Developed and crafted by SAS Shoemakers to follow the natural shape of your foot. Provides all day comfort with firm heel support and our exclusive EZ Lace™ system provides no bit adjustment across the instep. SAS SteadyTrac Midsole: A shock absorbing flexible lightweight unit with a forepart stabilizer that provides lateral stability throughout the walk cycle.